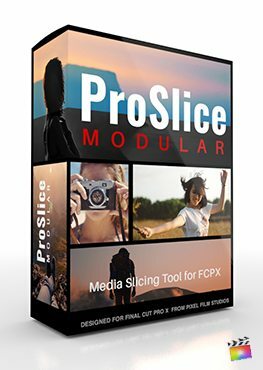 ProSlice: Levels from Pixel Film Studios is a new abstract media-slicing toolset for Final Cut Pro X. Film Editors can use these title layers to split-up media artistically, revealing new product lines, or introducing new characters or events. Each individual preset has a custom layout, making each animation unique. Multiple customization tools are included, giving users control over each overlay, reflection, and shadow opacity. ProSlice: Layers also includes camera angles allowing the user to give each preset a new perspective. Designed for any FCPX user and skill level. ProSlice: Levels contains over 30 Different presets to choose from. FCPX users can select multiply layouts, with multiple levels and animations. Each individual preset contains up to four Levels, which can be displayed as the original underlying media, drop zones, or color solids. ProSlice:Levels is a set of Title tools designed for Final Cut Pro X. FCPX users can select the preset they want to use, and apply it to the timeline above the desired media. Each title can be stretched to the correct length by simply dragging the end handles. FCPX users can colorize, blur, and apply different reflections to each individual preset layout with ProSlice: Layers. Each individual layout can have up to four layered panels, including a text layer, and multiple media layers. Different animations and reflections can be selected for more styles and variations. ProSlice: Levels is a unique title toolset designed specifically for FCPX. Each individual title contains animation presets, color overlays, outline controls, and shadow controls for users to maximize levels in the creative process. Motion Blur options are included for more realism. Where do I find ProSlice: Levels? Once the installation is complete, you can find ProSlice: Levels in the FCPX Titles library.